Well, it’s an “assembly” of the National Council of Teachers of English, and SLAM means the ‘Studies in Literacies and Multimedia.’ The “school” (wow, lots of quotes here already) is a series of periodic hangout videos in which folks in education and technology investigate the intersections of writing, multimedia, political action and more. You can follow the SLAM School at the blog and also on YouTube, and the videos are about 30 minutes long, and lots of guests are sharing knowledge about video, social media, advocacy and more. I believe this is the fourth installment of this series by the talented Gene Luen Yang (and Mike Holmes) in which the graphic story format weaves computer programming skills into the storyline. Sometimes, that works, particularly when the story pauses and the reader is invited to consider a solution to a puzzle or quandry. Other times, it feels a bit intrusive to the story. But I am enjoying this series very much, as the kids continue to figure out a mystery, with new twists and layers added each time. 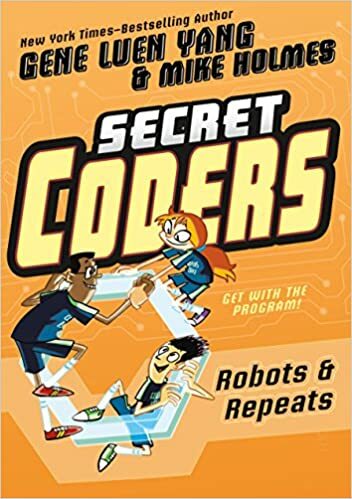 The Secret Coders series is a fun read, aimed at upper elementary and middle school readers. 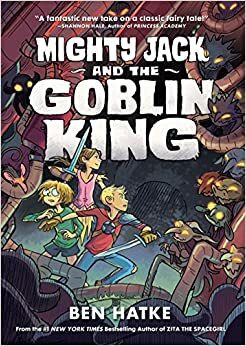 I am a huge fan of Ben Hatke, and this second book in his Jack series has only deepened my appreciation for his talents as a storyteller and artists. Hatke has taken the Jack and the Beanstalk into strange, new territory here, and I love that the story splinters and then comes back together in a way you might not suspect. He always has strong female characters, too. 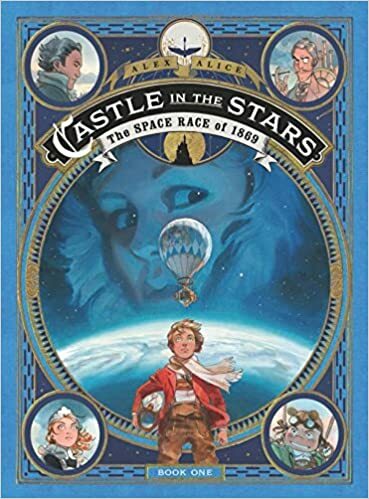 Mighty Jack’s story is not over, and the end of the novel brings another movie-like twist, reminding my son and I of another Hatke character that drew us into his world many years ago: Zita the Spacegirl (another series you should read). The Jack series is a solid read for elementary students, but middle school readers would probably enjoy it, too. I didn’t quite know what to expect from this one. It’s set as a sort of teenage love story, but with one of the two teenagers with a crush being a ghost stuck inside a house. The story gets more complex as it moves along, though, with hints early when we learn that the main character was born without a shadow (hints of Peter Pan?). 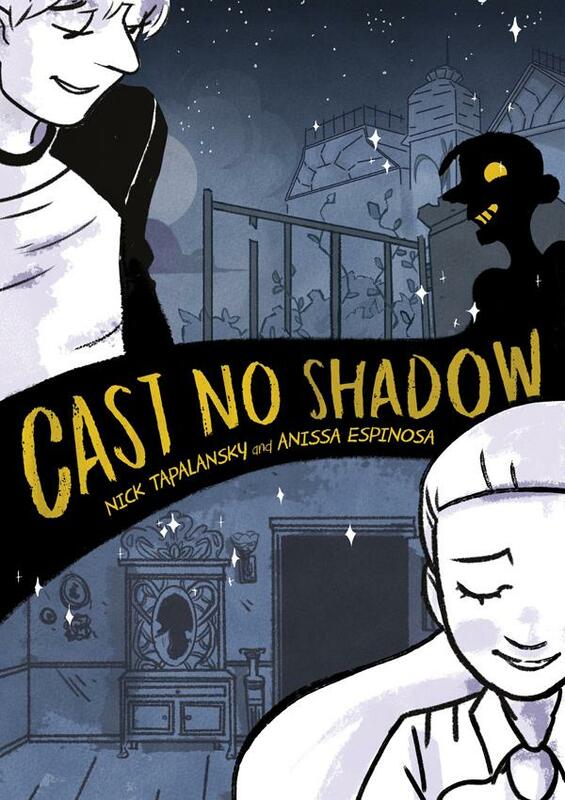 The more I read further, the more I liked this novel by Nick Tapalansky and Anissa Espinosa, as they weave humor and insight, and the strange entwining of history and the present, into a heart-warming tale of small-town goings-on. This book is aimed at high school, but middle school readers might find it interesting. There is nothing inappropriate for younger readers, however. In an email this week to Karon, Wendy and Ron, I noted that if this project I am describing here were all that came out of CLMOOC (Connected Learning MOOC) for me this summer, I would be quite content and satisfied. (Happily, there is much much more coming out of CLMOOC this summer). These three friends of mine all collaborated with me on a musical piece called Coloring the Muse that arose from the theme of art and coloring during the first Make Cycle, and then was transformed by our collaboration. Let me explain .. but first, let me share the project itself .. This project all began with our explorations of color in the first Make Cycle of CLMOOC. 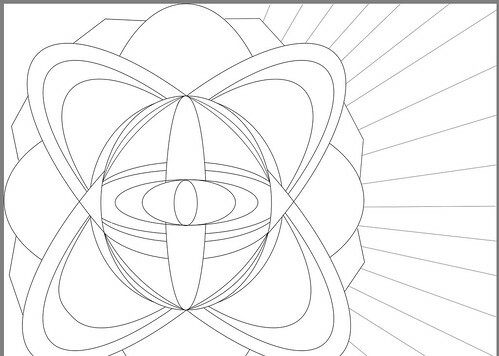 Much of that Make Cycle centered on the Collaborative Coloring Book project. At one point, though, Karon and others, in our Google Community, shared some links that connected the color spectrum to the music spectrum, linking how we hear sounds to how we perceive colors. I found that fascinating, and began to think about how one might “paint” with colors to make music. I tinkered a little bit with a melody line, based on some color patterns, and shared it back. 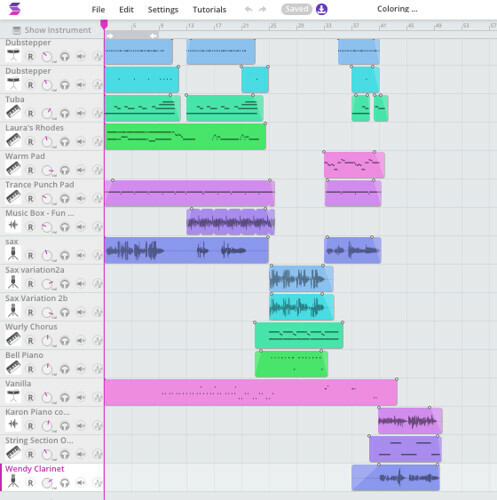 Karon, whose CLMOOC connection I appreciate each summer, took that melody and used a music compositional software program called Noteflight to begin the process of composing a song, with harmonies and variations. The software program does kick out an audio file, so we could hear the parts in progress. But I wondered if we might take the song into Soundtrap for some live collaborative recording. So I did, and I invited Karon and Ron (whose many talents include art and music via keyboards and programming) and Wendy (also a talented artist and musician). Soundtrap allows for distant, and global, collaboration on musical tracks. Ron is from the Netherlands, Wendy is from Australia and Karon and I are in the US. Perfect. As I began laying the first tracks, though, I kept the main melody line and some of the harmony ideas, but didn’t exactly follow Karon’s compositional ideas. Instead, we played with the song, using Karon’s ideas of variations as a springboard, weaving percussion and counter-melodies throughout. I added some alto sax after Karon wrote out the parts, riffing off the main line at times, and using some sound effects to create a layered variation. There’s even a bit of planned dissonance, creating tension. The ending of the song is a piano part that Karon composed, but the track is actually the compositional software’s version of the piano, with Wendy’s clarinet as melodic accompaniment. I also knew that I wanted to use the song as the soundtrack to a video with color, and I spent some time trying to find a way to do that. I could have done something more original myself, with iMovie or something, but I had this vision for an idea that I could not create myself, with colors dancing in time to the music. I ended up at a site called RenderForest, which has some neat templates but it is rather expensive to use if you want a video without their intrusive watermarks. I did find a coupon to discount it, and plunged to pay, since I really felt driven to have this color visualization be the visual for the music inspired by color spectrums. That’s not all … Wendy has now taken the song, pushed it through another remix program, and then created her own video version of the song and its colors. 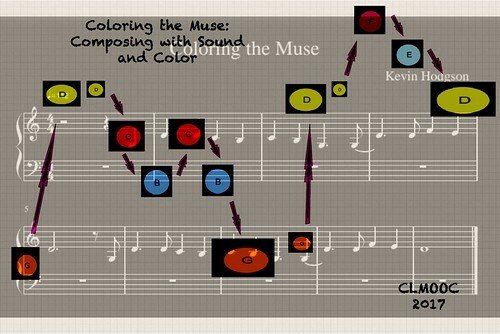 And Ron wrote about an earlier project of his, connecting music to color, and shapes. This is what CLMOOC is all about — emergent ideas that become the source for collaboration and creativity, following our passions through connections. We’re talking postcards this Make Cycle of the CLMOOC (Connected Learning MOOC), and in the past week, I received eight postcards in the mail from CLMOOC friends. 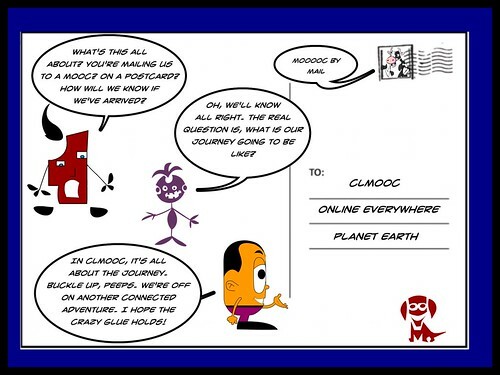 You can find more information about what we are doing, and how, as well as lots of ideas for connecting, at the CLMOOC website. I was holding my huge pile of postcards after our Make with Me Hangout the other night, and wondering how to share them all this week. There are more than 100 of them. An image, or two or three, would not really work. I decided to use my iStopmotion app on my iPad and just time-lapsed me putting each postcard down, making a pile as the lens went click click. What’s neat is the artistic range of the postcard, from handmade to images to quirky postcard themes. I love seeing them this way, all scattered into a pile of connected creativity. 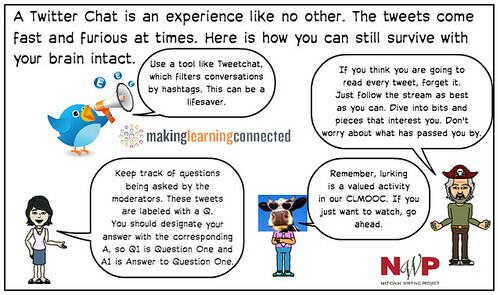 There are two Twitter chat today for CLMOOC. The first one — at 1 p.m. EST — is centered on Connected Learning and collaboration and the second one – at 7 p.m. — is centered on the postcard project. Come to one. Come to both. You are invited! Use the #CLMOOC hashtag on Twitter to follow the discussion and add some thoughts. 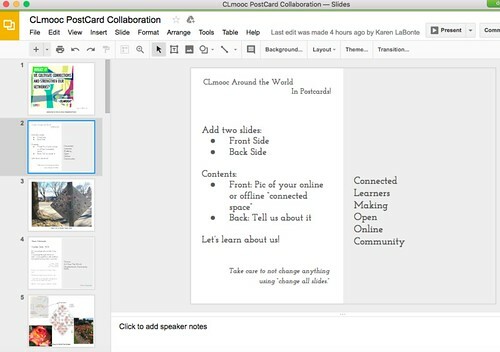 Last night, we had a fantastic discussion in a CLMOOC Make with Me Hangout that centered on the principles of Connected Learning; making and sending postcards through the year as connector points; collaboration among peers (and how CLMOOC might filter into our classrooms); and more. We’re all about postcards this Make Cycle of the CLMOOC (Connected Learning MOOC) and if you are interested, we have set up an ebook format with Google Presentation that is open for you to add a virtual postcard to our collaborative collection. Of course, don’t forget that we also do paper postcards in CLMOOC, and we are in the midst of a year of Data-themed Postcards (inspired by the wonderful Dear Data book). July’s theme was Food, and August will be Connections. More information about how to sign up and send/receive postcards all year is in the CLMOOC newsletter and we will be talking about the project tonight during a live Make with Me Hangout at 7 p.m. EST. For the collaborative ebook, you just use two of the formatted pages, adding an image (as the cover) and some text (as the back). It’s easy to do and we hope the book gets filled to overflowing with virtual postcards this week. Where you at? Come share with us. Follow this link to add your own. The second Make Cycle for CLMOOC (Connected Learning MOOC) now underway is centered on a postcard exchange between CLMOOC participants and how such offline connections are right in sync with online connections, and perhaps deepen those lines further than any online experience might. 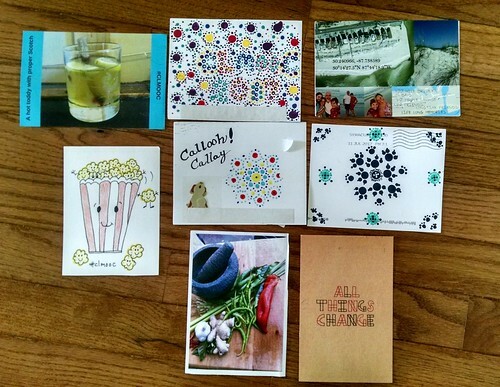 We’ll be exploring Connected Learning principles in relation to the postcard project (which essentially is a regular call for folks to send different kinds of postcards to each other, and since January, we have been doing monthly themed Data Postcards.) As this week starts, there are about 60 people on the mailing list and room for more. (You can learn more all this week and by reading the CLMOOC newsletter for this Make Cycle). I wanted to share two projects, related to this venture. First, this video montage was something I put together last year, to celebrate the many postcards I had received. I’ve since received many more (including four the other day), but this video story gives you a taste of what it is about. Second, this song — I am the Stamp — was a collaborative songwriting venture with Wendy and Ron, a recording experience to celebrate the postcards, as they were flying around the world with our global friends. It began as a poem by Wendy and went from there. 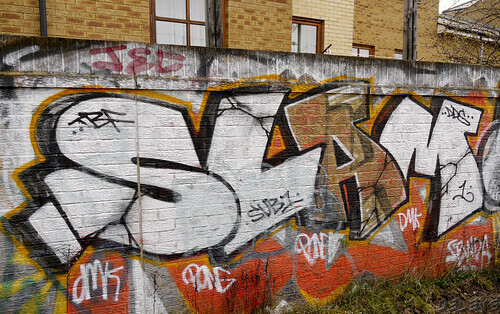 You can view the Zeega Media version here. We’re hosting a Google Hangout Make with Me tomorrow (Tuesday) night (7 p.m. EST) and then two Twitter Chats on Thursday (1 p.m. EST and 7 p.m. EST) to explore the notions of snail mail connections and Connected Learning. We hope you can join us. Officially (as if there was some stern administrator, with a clipboard in hand, checking off tasks), the first Make Cycle of CLMOOC is winding down. The reality is: CLMOOC Make Cycles never really ever end. That’s one of the many beautiful things about the crowd-sourced CLMOOC (Connected Learning MOOC): folks come in long after the summer and add to the creative adventures and conversations. The door is always open, and the mantra continues to be: Whenever you arrive, you’re right on time. Still, there are some flexible starting points and also, well, let’s call them, reflective points. I’ve written a lot already this week about the coloring and art that we have been doing, with a main project being the Collaborative Coloring Book, which now has nearly two dozen pieces submitted by CLMOOCers. 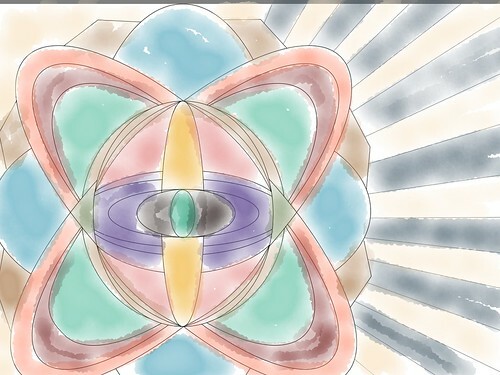 Who knew coloring could be so inventive and so CLMOOC-like? Well, our friend Algot did, and Ron also has always used art for expressions and connections. 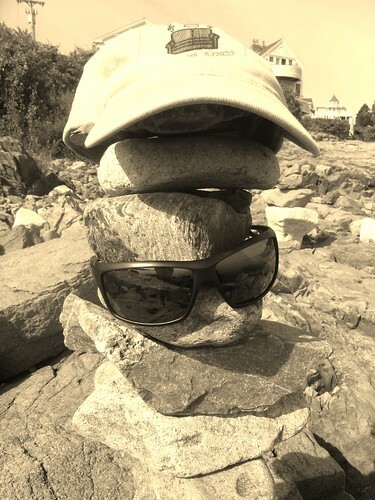 Thanks to both Ron and Algot for a fantastic kick-start to the summer’s playful explorations. Even though Make Cycle One continues, Make Cycle Two is coming around the bend. 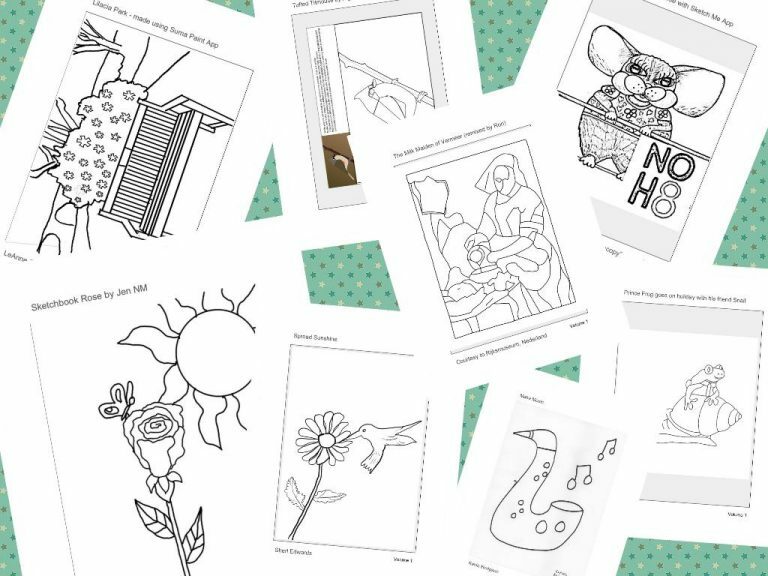 In CLMOOC this past week, we have been exploring coloring and art. It’s always nice when folks move outside of their comfort zone, so when Veronica — who took part in our Twitter chat the other day — shared some art for the Collaborative Coloring Book now underway, I saw a chance to remix and honor her art. First, I took a copy of her coloring image and moved it into the Paper App on my iPad. I’ve become quite fond of that app for doodling and wanted to try to use only the Watercolor feature with a rubber-tipped stylus I have. The problem is, I could not keep within the lines. While I appreciated the metaphor (outside the lines), the sloppiness made me wince a bit. I was determined not to give up, though. 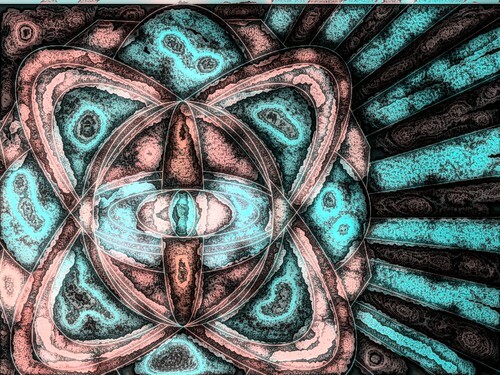 So, I pulled my colored image through another app — Painteresque — and tinkered with settings in all sorts of ways, trying to transform the work into something different, with echoes of the original. Finally, I flipped the color patterns in a sort of reverse move, and found what I was looking for. After sharing the image on Twitter with Veronica, I realized the new image looked like something from outer space, a planet. Or a satellite of sorts, perhaps entering orbit or breaking up. A poem emerged, which is always a nice way to leave things.